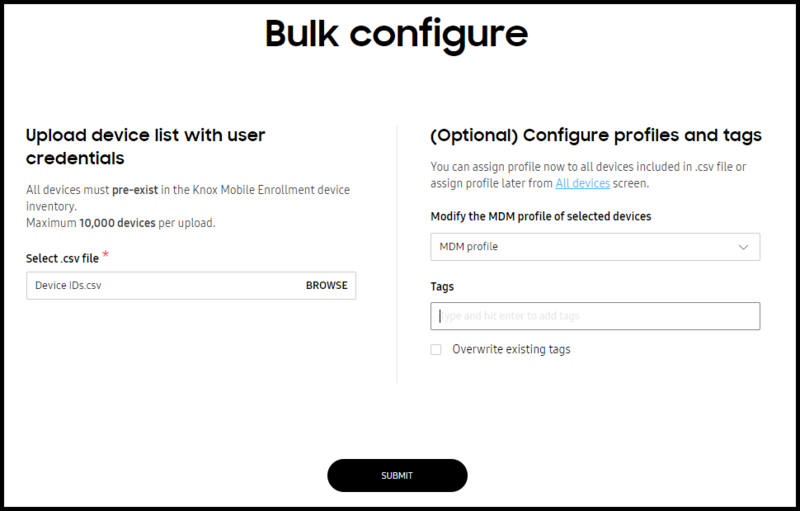 The Knox Mobile Enrollment console enables you to configure devices either individually or in bulk, and change MDM profile assignments as needed. Devices can also be deleted as they become obsolete and warrant removal from the portal. Select Devices from the left-hand navigation menu. Ensure the All Devices tab is selected within the Devices screen. NOTE - User IDs can be searched and displayed within the All Devices tab if you need to list user IDs with device data. NOTE - Refer to the STATUS column on the right-hand side of the All Devices screen to assess the pending enrollment, profile assignment and enrollment completion status of each listed device. NOTE - The columns that display on the top portion of the All Devices screen can be filtered by selecting the ellipses (...) to the right of the STATUS column. Refer to the ACTION drop-down menu on the right of the screen and select Configure. The Device Details screen displays if configuring a single selected device. The Configure selected devices screen displays if two or more devices are selected. Keep current profiles – Does not change the existing device profile assignment. This option is only available when more than one device is selected. Clear profiles – If a device has already been assigned a profile, selecting this option removes the profile from the device. When deleting a profile, all device assignments must be cleared before the profile can be deleted. For more information on deleting a profile from a device, go to: Profile configuration. Google DO with Knox License – This profile intends to support Google DO (Work Managed Device) with Knox Mobile Enrollment. For more information on Google DO support, go to: Google Device Owner (DO) support. Tags (single device selected) or Add tags to selected devices (two or more devices selected) — Enter the tags you want to assign to the devices. Tags allow you to organize and search for devices. If two or more devices are selected, optionally select Overwrite existing tags to use the newly entered tag to overwrite existing tags. NOTE - The NFC tag is automatically added when using the Knox Deployment App and cannot be deleted. User ID and Password (single device selected) - Enter a new User ID and Password for the selected device. If necessary, the User ID can searched and displayed within All Devices tab Search field. Overwrite user credentials – Enter a new User ID and Password for the selected devices. Click SAVE. The device status changes to Profile assigned. Status will not update until you click Refresh. If users are not sharing devices, you can provision unique MDM credentials for each device. Select devices to modify and download the device information as a CSV file. Enter User ID information in the CSV file column to the right of the Device IDs. You can also enter passwords in the column next to the User IDs if you so choose. Select the BULK ACTIONS from the bottom, left-hand, side of the Devices screen. Select BULK CONFIGURE. Upload the CSV file you have just edited. You can also Modify the MDM profile of selected devices by selecting a profile from the drop-down and/or select Tags associated with these devices. 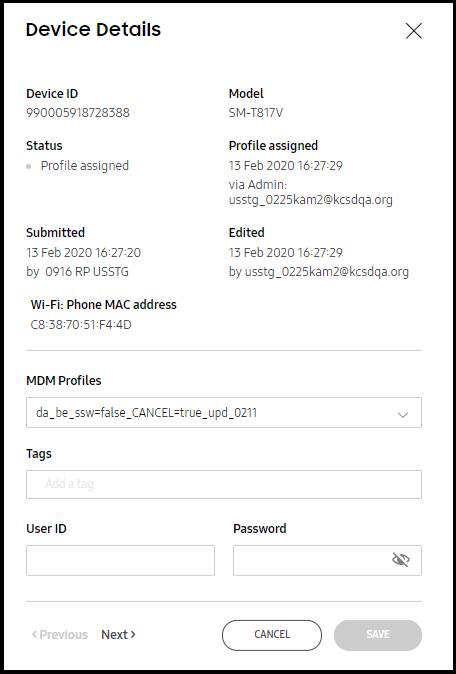 The Modify the MDM profile of selected devices drop-down menu also contains an option to Clear profiles from the device IDs in the uploaded CSV file. Consider this option when wanting bulk remove profile assignments from multiple devices. NOTE - For information on adding new profiles or editing configuration of existing profiles, go to: Profile configuration. Submit SUBMIT to proceed with the bulk configure operation using the uploaded CSV file. The columns within the All Devices screen can be filtered to display some or all nine of the columns available. Use the Customizable Table drop-down menu, invoked on the right-hand side of the column display, to de-select those columns you would like removed from the display. Use the filter options to select just those needed column values and select Save Changes. Once saved, the updated display settings are committed locally, and available in subsequent logins as long as the local system's cache is not refreshed. Device uploads can be individually reviewed before they are approved. The device Uploads screen displays devices uploaded into Knox Mobile Enrollment and pending approval. No NFC or approved devices display within the Uploads tab. If necessary, uploaded devices can be deleted and re-submitted back into KME. For more information, go to: Deleting devices. An IT admin may wish to periodically download all their uploaded devices for archive. This can be done as a single action, and include devices from various resellers. The CSV file download contains device uploads in various pre-approved states, but no NFC devices. NOTE - This function works similarly to bulk CSV file downloads as conducted from within the All Devices tab. Select the Uploads tab within the DEVICES screen. The Uploads screen displays each listed device's reseller, upload date, order number, order date, number of devices uploaded, upload approval status and details. Optionally select the View link under the DETAILS column to list the individual devices uploaded by listed the selected reseller. These listed devices can be configured as required for approval. For more information, go to: Device configuration. NOTE - Pending devices can be searched and displayed from the Uploads column by entering the device's 14 or 15 digit IMEI (numeric device identifier) within the Search field. The search result displays within a new screen with device information listed in black and a device status of pending. Optionally download the search result as a CSV file or repeat the search function using the IMEI of other target pending devices. NOTE - Additionally, User IDs can be searched and displayed within the All Devices tab when entered within search field. Optionally select Download all as CSV file to save the listed devices and their supporting data as a CSV file. Either open or save the CSV file when prompted. The downloaded CSV contains important data that can be re-used if a device requires re-enrollment, including a device's IMEI (numeric device identifier), serial number, order number, order date, model, user ID, tags, submitted date, profile, status, reseller ID, reseller name, last modified admin, and last modified time. Devices can be deleted from KME by either selecting them from the Knox Mobile Enrollment portal or by uploading a list of device IMEI/MEIDs. Both NFC and non-NFC devices can be deleted. Once you have removed a device, it is permanently removed from the system. To put the device back in Knox Mobile Enrollment, your reseller must upload the device again, or you can use the Knox Deployment app (available from the Google Play Store). Any device removed from the Knox Mobile Enrollment portal is also removed from Knox Resellers Portal and Knox Configure (if applicable), so take care to only delete devices when you must. Select the All Devices tab within the DEVICES screen. A device can also be selected from the Uploads tab, but the View link must be selected from under the Details column. Select one or more listed devices to permanently remove. Select the ellipses (...) to the right of the STATUS column. A Delete Devices screen displays reminding the user that once a device is deleted it is permanently removed from the system. Select the DELETE button to proceed with the device removal. 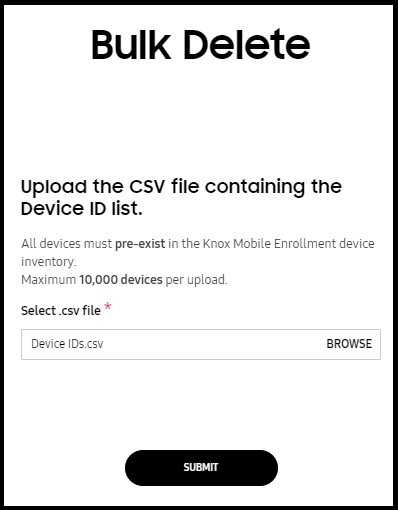 Optionally upload a CSV file, populated with Knox Mobile Enrollment device IDs as an alternative means of removing devices. 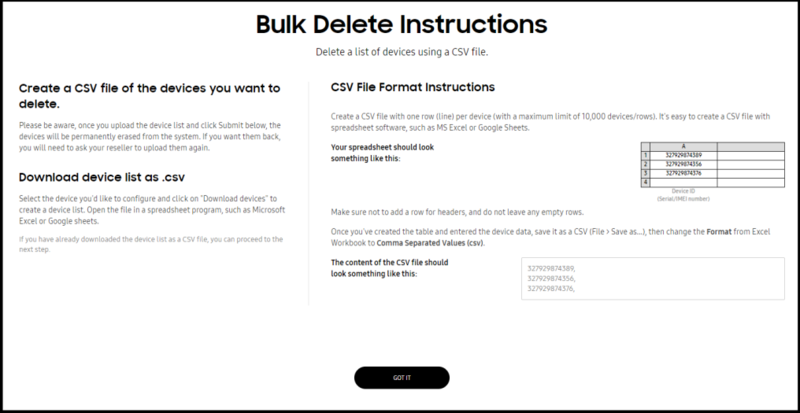 Devices can be individually deleted or deleted in bulk using a CSV file. Select the All Devices tab within the DEVICES screen. Select the Delete via CSV file option. Follow the listed instructions to create and/or upload a list of the devices to delete. Select GOT IT to proceed. Add the CSV file into the Bulk Delete screen and select SUBMIT. A Delete devices screen displays reminding the user that once the devices in the CSV file are deleted they are permanently removed from the system. Select DELETE to proceed with the device removal.